The LC9 is a double-action-only, hammer-fired, locked-breech pistol with a smooth trigger pull. Control and confident handling of the Ruger LC9 are accomplished through reduced recoil and aggressive frame checkering for a positive grip in all conditions. 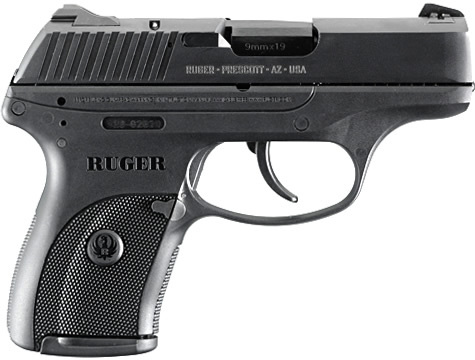 The Ruger LC9 features smooth “melted” edges for ease of holstering, carrying and drawing. COMPACT, the LC9 is just slightly larger (less than 1″ in both height and length) than the popular LCP. RUGGED CONSTRUCTION with blued, through-hardened alloy steel slide and black, one-piece high-performance,glass-filled nylon grip frame. DOVETAILED, HIGH VISIBILITY 3-DOT SIGHT SYSTEM with windage-adjustable rear sight and fixed front sight. FINGER GRIP EXTENSION FLOORPLATE can be added to the magazine for comfort and grip. SAFETY FEATURES include internal lock, manual safety, magazine safety and loaded chamber indicator which providesvisual and tactile indication that chamber is loaded.